Welcome to Stone Head House, near Lothersdale, North Yorkshire. 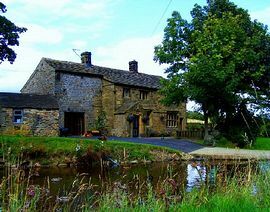 Built in 1596 just off the Pennine Way, this beautiful Manor House later served as a working farm, and now provides accommodation as a Bed and Breakfast in the small valley of Stone Head. Every effort has been made to restore Stone Head House in an appropriate way. The whole of the downstairs has flagged floors. Breakfast is cooked on the Aga in the quaint farmhouse kitchen then served in the inglenook diningroom with its enormous fireplace. Eggs are provided by our own hens and tomatoes and mushrooms are grown here when possible. Sausage, black pudding and white pudding are made to our own recipes (courses available). We cure local pork backs for our bacon. Butter, jams and marmalade are made here and the milk comes from the cows on our own land. Meanwhile, nearby, the North Yorkshire market town of Skipton, the gateway to the Yorkshire Dales, won 'Best High Street in Britain 2009'. Prices from £62 to £86 per room including breakfast. We are situated just off the main road which links Cowling in Yorkshire with Laneshawbridge in Lancashire. We are about 45 minutes from the M62 and 10 minutes from the M65. Approximately 7 miles from Skipton and close to the Pennine Way.